Less Rain Than Forecast, But Southern California Still Ahead of La Nina. For 60 Days Ending November 22, 2010 at 4:00 a.m.
Saturday's front wasn't as strong as expected, but still produced some resepectable rainfall totals. Sunday's front was better defined and had better dynamics, but moved through the area relatively quickly. The end result is that water year precipitation totals remain near to above normal for many Southern California locales, and about 0.15 inch below normal for Downtown Los Angeles. Precipitation totals varied widely. 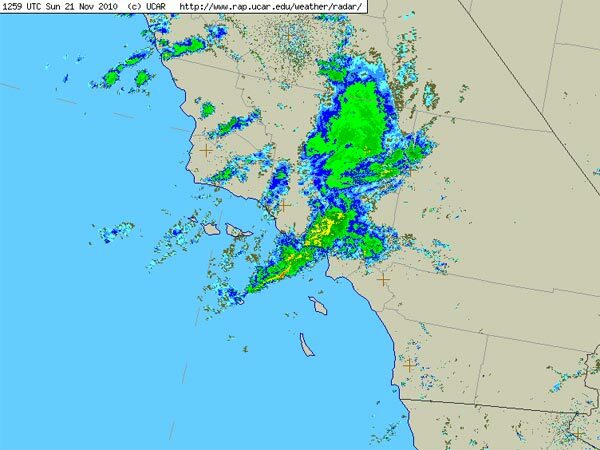 In the Los Angeles basin and surrounding valleys amounts generally ranged from about 0.25 inch to 1.0 inch. Foothill and mountain locations in Los Angeles county recorded about 1.0 to 2.0 inches, but several stations recorded over 2.0 inches. Tanbark in the San Gabriel Mountains recorded 3.51 inches, and Ortega Hill in the Ventura Mountains recorded 5.0 inches! Here's an archived copy of a NWS Los Angeles/Oxnard Public Information Statement with some precipitation totals from around the area. A drier version of last weekend's system -- with a more inland track -- is forecast to produce more rain and snow in the northern two-thirds of California through midweek, but not much precipitation is expected in Southern California. This morning's 09z SREF pegged the chance of more than 0.1 inch in coastal Southern California for the 24 hours ending 4:00 a.m. Wednesday at between 30% and 50%, and the chance of more than 0.01 inch at around 90%. The 00z 11/23/10 NAM forecast is slightly wetter south of Pt. Conception than the 18z NAM, but is still forecasting under 0.1 inch in most areas. It was cold in Southern California last night with lows dipping into the 30's in many valley locations. Malibu Canyon recorded a low of 30°F. Cold overnight temperatures are exepected to continue through Thanksgiving. For the 2-Day Period Ending 4:00 p.m. Sunday. 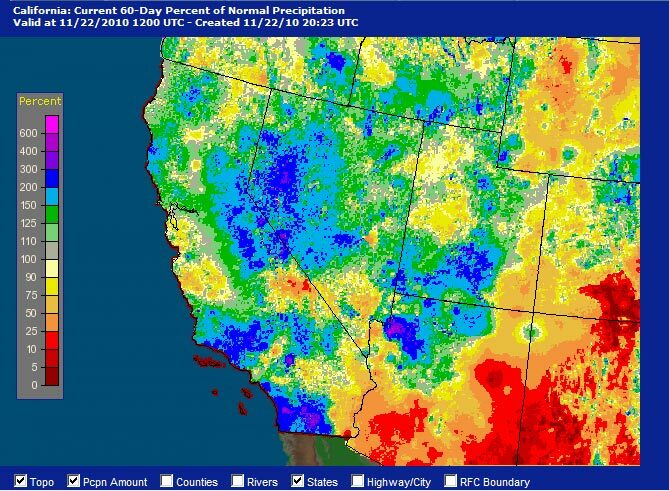 Thanks to October's unusual amount of rainfall, precipitation totals for many areas of Southern California remain near or above normal for the 2010-11 water year. But November has been relatively dry, and Downtown Los Angeles (USC) is now about 0.30 inch below normal for the month, and for the water year. That's expected to change over the weekend. A series of impulses on the downstream side of a high amplitude upper ridge is forecast to amplify a trough and generate an energetic upper low along the coast of the western U.S. tonight. The 00z NAM/WRF shows a strong front moving down the coast and through Southern California on Saturday, a second impulse on Sunday, and possibly a third on Monday. BUFKIT analysis of this evening's 00z NAM data for Van Nuys project rainfall totals of about an inch over the 24 hr. period ending Saturday at 4:00 p.m., and then another third of an inch or so Sunday. The 00z GFS isn't as generous with the rainfall amounts, generating about 0.5 inch on Saturday and 0.3 inch on Sunday, but appears too fast when compared to current satellite and radar images. SREF means & spreads suggest amounts across the area should generally range from about 0.5 inch to 1.25 inches, with more expected in the mountains. We'll see! Wet October. Record November Highs. MEI Ends Record Plunge. For 30 Days Ending November 1, 2010. 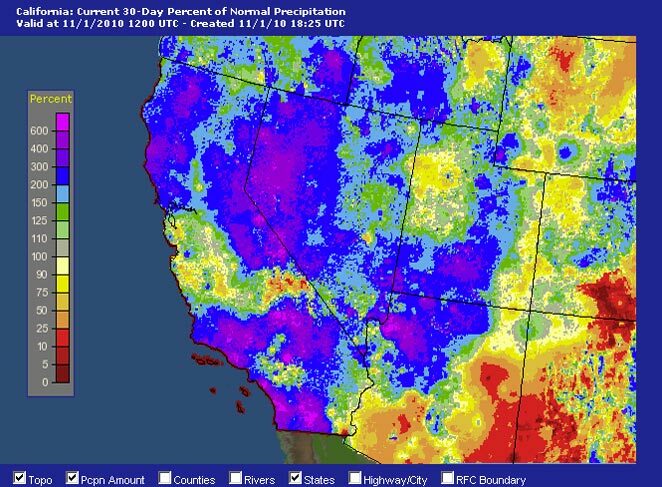 October was an unusually wet month in coastal Southern California. Many areas recorded more than an inch above normal rainfall, and some as much as 3 inches above normal. In a month where around 0.5 inch is considered normal, some areas received several times the normal amount of rainfall. Most of October's rain resulted from two energetic upper lows, and a relatively strong trough/front that swept through the area October 30th. The front produced a new precipitation record for the date of 1.09 inches at Santa Barbara Airport Here's an archived NWS Public Information Statement with some rainfall totals for that storm. Last week, an approaching Pacific trough pumped up a thick high pressure ridge over California, sending temperatures soaring and breaking temperature records across the area. November 3rd Long Beach Airport set a new high temperature record for the date of 100°F, and Downtown Los Angeles set a new record of 97°F. November 4th temps were once again in high 90s and several stations broke or tied high temperature records. Here are archived copies of the NWS Record Event reports for November 3 and November 4. The southern part of the Pacific trough that produced our record high temps cut-off into a small upper low as it approached the coast, and moved onshore north of the Los Angeles basin on Saturday. The remainder of the trough and its associated front moved through the area Sunday evening into Monday. The front held together a little better than expected, and rainfall totals in the Los Angeles basin and valleys generally ranged from about 0.10 inch to 0.30 inch. Here's an archived NWS Public Information Statement with some rainfall totals from around the area.. The latest round of rainfall leaves many areas of Southern California way ahead on rainfall totals for the water year. Downtown Los Angeles (USC) missed out on a couple of the systems, and as of close of business yesterday has recorded 1.10 inch for the water year, which is only 0.06 inch above normal. By comparison, Los Angeles Airport is 0.85 inch above normal, and Camarillo/Oxnard is 0.97 inch above normal. This headstart on the rain season should help keep our rainfall totals a little closer to normal as our La Nina influenced rain season continues. Speaking of La Nina, the September/October value of the Multivariate ENSO Index (MEI) increased slightly by 0.079 sigma, ending the record plunge from El Nino conditions earlier this year. In the past 30 days there was some decrease in the magnitude of negative SST anomalies in the east-central equatorial Pacific, but subsurface temperatures remain quite cool. Computer models are split on whether Nino 3.4 SST anomalies will continue to decline in magnitude during the Northern Hemisphere winter, but nearly all models indicate decreasing anomalies in early 2011. We'll see!